Fuji Small Size Pistol Grip Model Impact Wrenches are designed for giving high torque at low speed, which give the best characteristics for fast reliable and accurate tightening. Fuji Small Size Pistol Grip Model Impact Wrenches are suitable for various fastening and unfastening operations. The combination of high torque and fast run down minimize operator fatigue. The 5412053533 Fuji Standard Small Size Pistol Grip Model Impact Wrench is one of thousands of quality tooling products available from MRO Tools. Please browse Fuji Small Size Pistol Grip Model Impact Wrenches for tools similar to the 5412053533 Fuji Standard Small Size Pistol Grip Model Impact Wrench. 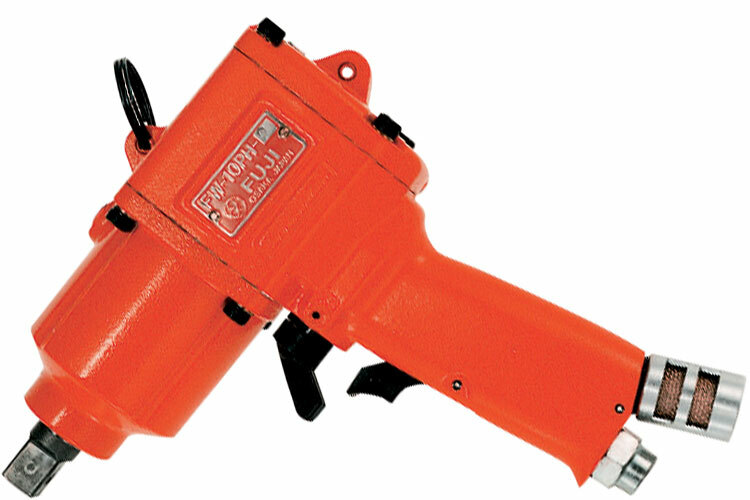 5412053533 Fuji Standard Small Size Pistol Grip Model Impact Wrench description summary: Model: FW-10PH-2 E Recommended Torque Range: 47 - 79(N.m) Max Torque: 100(N.m) Free Speed: 7,500min-¹ Square Drive: 1/2'' Socket Retainer: Pin (BF-Anvil) Overall Length: 7.05'' Weight: 4.41lb Air Consumption: 0.45m³/min Quantity discounts may be available for the 5412053533 Fuji Standard Small Size Pistol Grip Model Impact Wrench. Please contact MRO Tools for details.